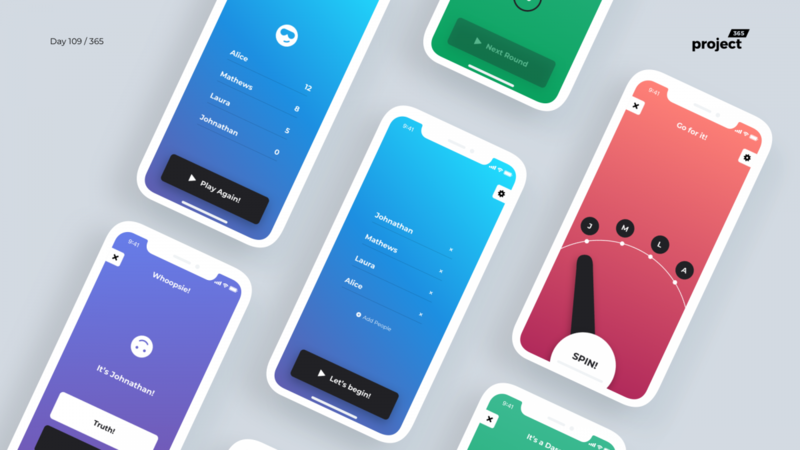 Brief: To design a mobile app/game with a ton of gradients. It’s Disruptive Thursday and today’s disruption is to design something with a lot of gradients! Designing with Gradients is not easy. At least for me, I do not go with flashy stuff and hence I took this challenge up! Here’s a fun mobile game – Truth or Dare. It’s the conventional college game that you guys play IRL, with a digital twist. You can add players, spin the wheel and get funny truth or dare challenges! Thanks a lot, mate. Appreciation like this keeps me going! I don’t know how you do it, but that is some serious dedication! I am posting about it here: https://project52.tech I plan to make it a coding challenge and design challenge (I am very new to UI/UX) so I will post with proof of concept and (almost) full blown apps every week! It has been a Challenge mate, that’s why I took it up in the first place. It has taken a toll on my sleep and health though, I hope it’s worth it in the end. I’ve been wanting to write a blog about how I plan and do this but never got around to write that out. Hopefully soon! Anyway, I’m glad that you’re taking up a challenge. It’s that attitude that matters. I’m sure you can do it. Just be motivated. I’m looking forward to your posts! Hey, the design of this game is very good. Can I implement your game as an App? But I need your slice to complete, I have already carried out the code research on this side, confirm that it can be achieved, look forward to reply, thank you. Hey buddy, that’d be so great. Are you looking to get this done just for fun? What are you looking at for monetisation and stuff? Also, is it going to be iOS or Android? Let me know if you are interested, you can get in touch with me on Twitter DM. When I saw this design, I was very surprised. I didn’t think about making a profit through it because my first impression was to keep his “pure”. Regarding the platform (Android or IOS), if I have enough time here to get both platforms to complete, I will start Android development in the early stage. If time is convenient, then iOS will follow. I have already followed you on Twitter. After this reply, we can communicate on Twitter DM. Your intention seems to be nice! If it was me, I’d want to keep it pure and simple as-well. Our thoughts are the same, I have already DM you on Twitter, are we moving?